"A real treat for the holidays. My family enjoys these on Christmas morning." Pour the orange liqueur in a shallow bowl; put the sugar in a saucer. Dip just the rims of 6 glasses in the orange liqueur and then in the sugar to form a thin sugared rim. Divide remaining orange liqueur and orange juice among the 6 prepared glasses. Top with champagne. Serve immediately. Make this classic holiday treat using leftover brownies! This is insane good. I could drink these all night. Even my husband, the whiskey drinker, liked this. YUM. A great drink to celebrate Mother's Day (or any occasion for that matter!). 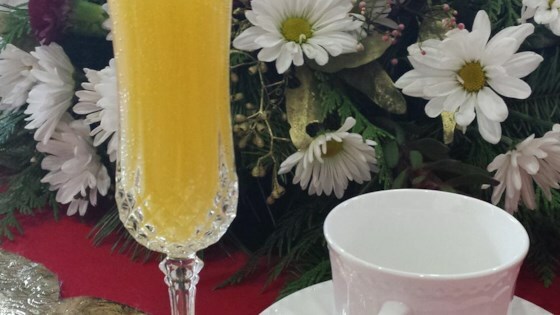 These are easy to prepare and a tasty twist on traditional mimosas. A definite make again. Easy and delicious! I loved the rim with sugar, it looked special! Will make again. This has been our regular mimosa recipe I've used for years.....nothing is better than this composition in my opinion!